Sketch by Indianapolis, Indiana, adult female after abduction experience in 1965, when she was 18-years-old. She has been abducted periodically since age four by the “EBEN” grey type that have vertical pupils in their yellow eyes beneath the black lenses worn to see in infrared and other frequencies. 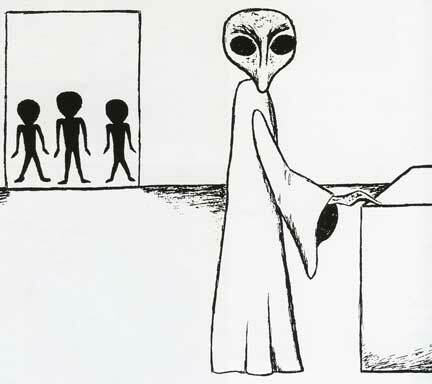 This abductee, like so many others, says the small beings pictured in the doorway are biological androids produced by the taller EBENs or other entity types through cloning and genetic manipulation. Many abductees say the cloned biological androids are made and programmed for various tasks on various planets of different atmospheres, different solar intensities, different water contents — different models of sophisticated biological machines for different planetary investigations. Reposted July 20, 2018 - March 31, 2014 Albuquerque, New Mexico - In Part 1 of this series of reports, Judy Doraty — abducted along with her teenage daughter, Cindy from their car near Houston, Texas, in May 1973 — described cat-eyed beings testing Earth environments for a toxin that can threaten Earth life. The grey EBEN types are some of the extraterrestrial biological entities (EBEs) responsible for bloodless animal mutilations around this planet for at least a century.